One would imagine that in a society where roughly 85% of the people are practicing Buddhists, vegetarian restaurants could be found on every corner. 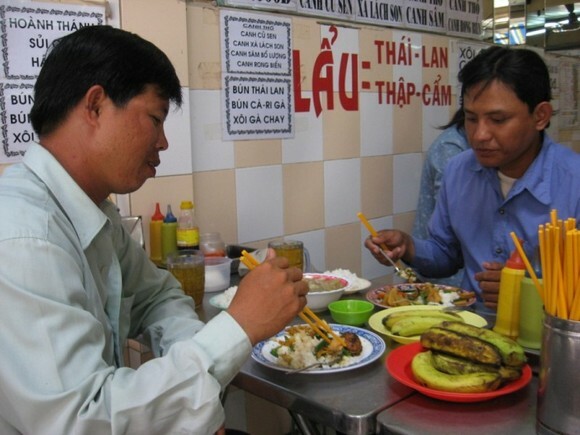 While this may be true in some parts of Asia, it is certainly not the case in Saigon, where eateries specializing in com chay are few and far between. Huong Vien’s specialty is vegetarian renditions of Vietnamese classics such as pho, lau (hot pot), and bun rieu. The xoi ga chay (sticky rice with “chicken”) is especially stellar and unbelievably similar to the meaty xoi ga and xoi man sold street-side. A plate of xoi ga chay is priced at VND4,000. Another winning dish is the banh hoi thit nuong (vermicelli noodle cakes topped with grilled “pork”). The meaty mouth-feel and smoky marinade of the soy “pork” is nothing short of excellent. A heaping portion of banh hoi thit nuong is priced at VND10,000. A must-try treat at Giac Duc is the thit heo quay (barbecued pork). The dish looks and tastes so ridiculously pork-like, it is hard to believe that no swine were harmed in the process. The true genius of this dish lies in the tapioca film that brilliantly fakes the layer of fat found in real thit heo quay. A portion for two is priced at VND10,000. Giac Duc also makes one of the best canh chua (sweet and sour soup) in town. The VND5,000 bowl of soup is brimming with okra, elephant ears, tomatoes, and bean sprouts. Although Thanh Luong’s menu is slightly limited compared to the others, the quality of the food is first-class. The best way to enjoy Thanh Luong’s offerings is by ordering a variety of dishes and plenty of steamed rice. 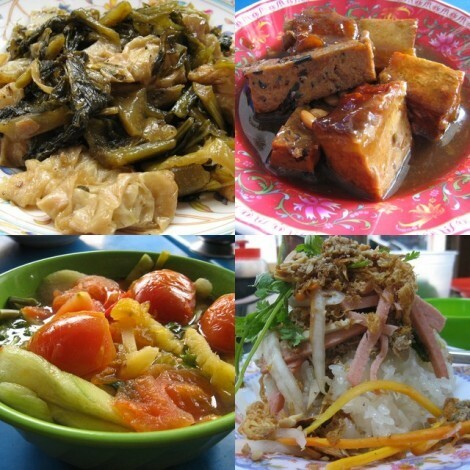 The dau hu xa (lemongrass tofu) and bean curd with mustard greens are solid choices. “Sardines” wrapped in seaweed, one of the more interesting menu items, taste surprisingly fishy for a creation made entirely inland. Awesome! Although I am no vegetarian, I love well-executed fake meat. Its like alchemy, creating meats out of gluten, bean curd, tapioca starch, and yam flower. I went down to Giac Duc today to try out that pork you were talking about. I somehow forgot to read about the cahn chau soup. Not to worry though the lovely lady working there fed it to me anyway, and as you wrote it was amazing, the best I have had so far. I love your blog, I have a lot of vegetarian friends here and they need to stop eating pizza. Well, at least bad pizza. so I’m gonna use your post as a starting point. Brilliant. slavophiliac – sweet! I’m glad you had a super experience. You should also try Huong Vien down the street. will do, i want to try out all of your suggestions, but i fallen so far behind i don’t know if i’ll ever catch up. maybe once i get a scooter i can start making more progress.